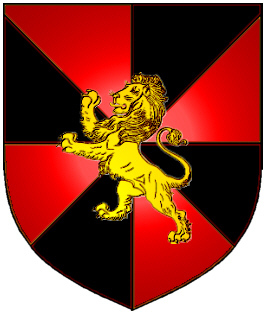 Eight black and red segments with overall a gold lion rampant. 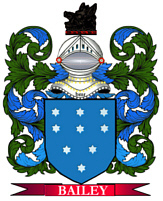 The 'Matteson Historical Congress of America' has declared the coat of arms at left to be the offical arms for their organization. Nearly all Mattesons in America descend from one Henry Matteson who came to Rhode Island in 1666, whose family originated from Denmark. A hand holding a sword, emerging from a crown. 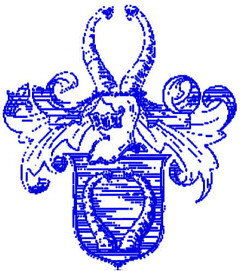 Fac et Spera. Motto Translated: Do and hope. English: Spelling variations include: Matheson, Mathieson, Mathewson, Mathison, Mathissen, Mathowson, Mathussan, Mathyson, MacMath, Matheison, MacMakan, MacMaken, Mathie, Mathies, Matthewson, Mattheson, Matteson, Mateson, Mathesin, Mathiason, Matthysen and many more. MATHEWS (British). Possibly a modern form of the ancient Irish name "MacMahon". MATTHEW (British). "Gift of God" (Hebrew); through Mark the Apostle. MATTHIAS (British). Form of Matthew. MATTIOLI (Italian). Italian form of Matthew. First found in South-western England, where they were seated from very early times. Some of the first settlers of this name or some of its variants were: Hugh Matheson and his wife and three children, who settled in North Carolina in 1774, James Matheson, who settled with his wife in North Carolina in 1775, Matthias Mathiason, who settled in Maryland in 1695, Hendrick Mathiason, who settled in Delaware in 1661, Kenneth Mathieson, who settled in the Barbados in 1745, John Mathewson, who settled in Georgia in 1733, as well as Andrew Matteson, who settled in Philadelphia in 1880. Henry Matteson who came to Rhode Island in 1666. James Mathewson settled in RI in the 1600's. The scene in London and elsewhere, when Henry Matteson immigrated to America during the year of 1666. 1665 The villagers of Eyam in Derbyshire, England, voluntarily isolated themselves so as not to spread the plague. 250 of 350 people died and the town became known as the Plague Village. 1665 Joseph Smith arrived in North America and became secretary to William Penn. 1665 The British briefly recaptured the Banda Island of Run from the Dutch. 1665 In London at least 68,000 people died of the plague this year. In 1722 Daniel Defoe published his novel “A Journal of the Plague Year.” The novel posed as a historical document covering the London plague. The Lord Mayor of London exterminated all the city’s cats and dogs, which allowed the rats, the real transmitters of the disease, to increase exponentially. 1665-1666 Over a span of 18 months Isaac Newton invented calculus, explained how gravity works, and discovered his laws of motion. This period came to be called his annus mirabilis. forgot to extinguish his oven. The flames raged uncontrollably for the next few days, helped along by the wind, as well as by warehouses full of oil and other flammable substances. Approximately 13,200 houses, 90 churches and 50 livery company halls burned down or exploded. But the fire claimed only 16 lives, and it actually helped impede the spread of the deadly Black Plague, as most of the disease-carrying rats were killed in the fire. This fire later proved to be a blessing in disquise. 1666 Sep 5, The great fire of London, begun on Sep 2, was extinguished. Old St. Paul’s was among the 87 churches burned down. 1666 Nov 14, Samuel Pepys reported the on 1st blood transfusion, which was between dogs. 1666 Pierre-Paul Riquet convinced French finance minister Colbert for a canal from the Mediterranean port of Sete to Toulouse and the River Garonne. He oversaw the Canal du Midi project for 15 years and died 6 months before it was completed. 1666 The plague decimated London and Isaac Newton moved to the country. He had already discovered the binomial theorem at Cambridge and was offered the post of professor of mathematics. Newton formulated his law of universal gravitation. In Ireland the Lion represented the 'lion' season, prior to the full arrival of Summer. The symbol can also represent a great Warrior or Chief.